Over the past decade, I’ve been asked the same questions many times. I’ve compiled my answers here to share with you so that when we speak, we can focus on YOU and your design goals. Heather: In 1997, I launched my publication design firm, after working in design studios and associations for over a decade. In 2002, my firm merged with another design firm to create MillerCox Design. So I’ve been in the field of publication design, and understanding how publications fit in with organizational strategy, for 20 years. I’ve also planned, coded and built over 50 highly-branded, custom-themed web sites ( I love WordPress). What do you know about marketing and design strategy, in the context of nonprofit communications? Heather: As a business major in college, and as a small business owner for over a decade, I’ve learned a lot about marketing strategy, and I use this knowledge to help my non-profit clients convey their impact and reach more supporters. To sharpen my strategy skills, I am actively involved in several well-regarded business education and mentoring programs. I regularly attend high-level learning days about marketing strategy, finance, and operations. I enjoy reading books about marketing and business, and I am a lifelong learner who thrives in an evolving environment. Heather: With well over a decade spent planning, designing and building web sites, I’ve learned how to use digital channels, primarily FaceBook, Linkedin and Twitter to feature new publications, drive traffic to my client’s website and to further inform and engage supporters. With multi-channel projects, planning is key, and I always start by asking a lot of questions. Technically, I thoroughly understand HTML and CSS code. Heather: Most of our work is with enterprise-level non-profits, and our clients include federal agencies, large nonprofits, charter schools, well-known public policy institutes, venerable universities, and associations. Of note are long-standing relationships with Georgetown University and The Brookings Institution. How are you different than a freelance designer, and how would the services you provide differ? We are not your ‘average’ graphic design firm. We are highly focused on publication design and members of the AIGA, a worldwide network of graphic design professionals. So when you work with our team to improve your printed publications, you’re gaining access to a wealth of design experience that is much more powerful than any general design freelancer could offer. Our team includes conceptual thinkers, expert typographers, meticulous proofreaders, and great project managers. We use the latest software, and carefully version and backup every round of page proofs we submit. 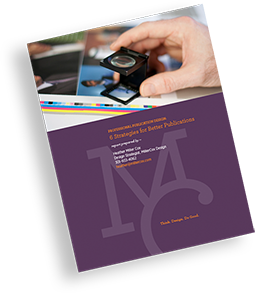 And we have the best prepress guy around: since we’ve put 350 + publications on press, we know how to prepare files so that they run right, choose paper, and work with printers. How do you price your publication design services? Heather: Often we will review a client’s previous annual report, to come up with a price estimate. We ask a lot of questions, and do some initial simple calculations such as the number of running pages, front material pages, unique sections, photos, charts, graphs and tables. We add on the number of cover and interior design options a client would like to invest in, and we add in the cost of three distinct rounds of diminishing edits. Next, we determine whether a project will benefit from stock photography, custom photo shoots, and illustrations. Additionally, we work with experts who can help you to determine and convey your impact effectively in the report, and we team with expert nonprofit writers and editors when our clients request assistance in developing content. After this initial discussion, we see if your requests are aligned with your budget restrictions, and our ballpark estimate. If it is, we draw up a formal agreement. After pricing hundreds of publications, we’ve gotten pretty good at estimating. This initial strategy allows us to eliminate surprises in pricing our services. Heather: You can expect strategic thinking, meticulous design, error-free work, timely check-ins, regular reporting of schedules, deliverables, and next steps. If the project is important to you, it’s equally important to us. We make sure that you look like a hero to your peers and colleagues at the end of our engagement, and come away with a well-regarded publication. Heather: First off, we will ask you to fill out our “get-acquainted” worksheet, so we understand your project goals. Next we can set up a 30-minute get-acquainted phone call. Please contact us at 301-933-4062, Monday – Friday between 9 am – 5 pm EST, or fill out our contact form on our contact page. Can I contact some of your previous clients? Heather: Absolutely. They are easy to connect with from LinkedIn, and I can provide names of recent clients.